By the time I was 11 years old, I had bid my EZ bake oven goodbye and tucked my Tiny Tears doll into her rock-bye crib for the last time. Like most other pre pubescent girls in the mid 1960’s I was ready to target more weighty matters- like what I wanted to be when I grew up. We were, our Weekly Readers told us, a new generation of girls, fueled first by the New Frontier challenges of JFK, now primed and ready to join LBJ’s Great Society. To assist us on our journey was a brand new board game called “What Shall I Be? 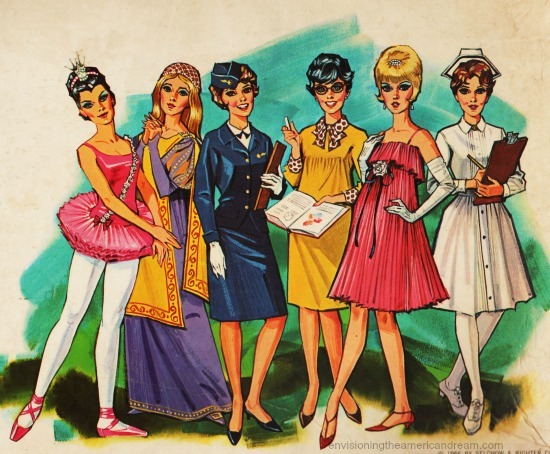 The Exciting Game of Career Girls.” Debuting in 1966 it was made by Selchow & Righter Company makers of the popular game of Parcheesi. 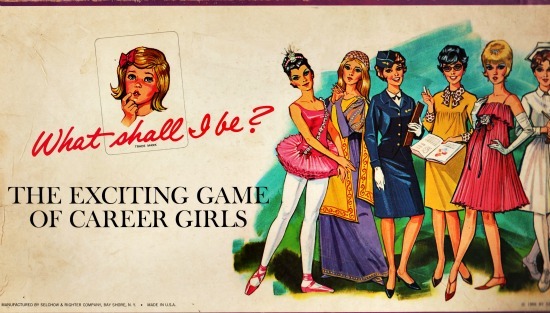 Along with “Miss Popularity” and “Mystery Date”, “What Shall I Be?” formed the holy grail of board games designed to prepare a young girl with the essential skills needed for the exciting game of life of which she apparently hadn’t a clue. 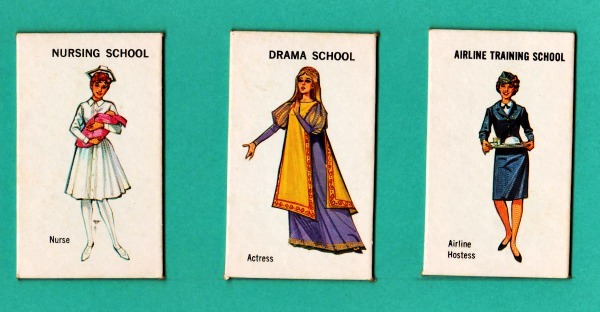 The object of the game was to be the first player to become a Career Girl, achieved by collecting school, subject and personality cards for specific careers. With the roll of the dice the thrilling world of career options awaited me. But the cards were stacked against the girls of the 1960s. 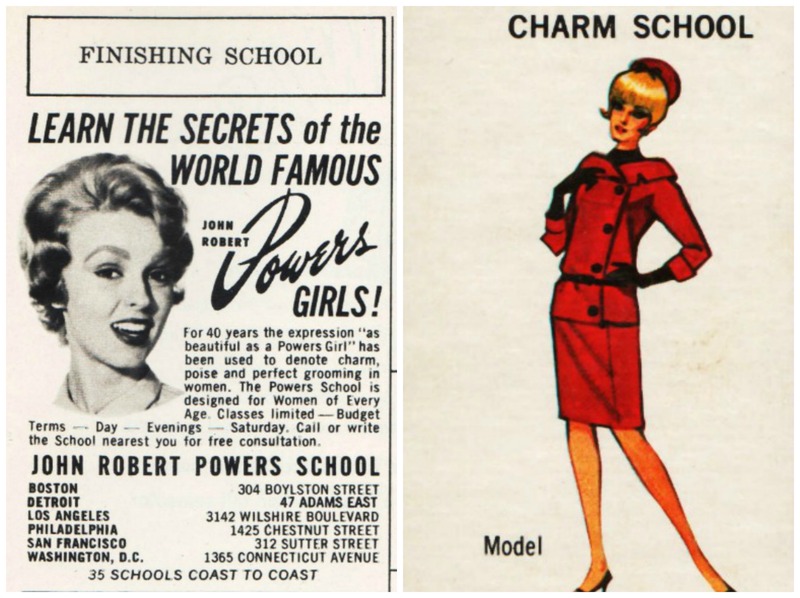 Mad Men’s Peggy Olsen may have scored a corner office in a big Madison Avenue office , but the options presented to a real life girl in 1966 were less than thrilling. 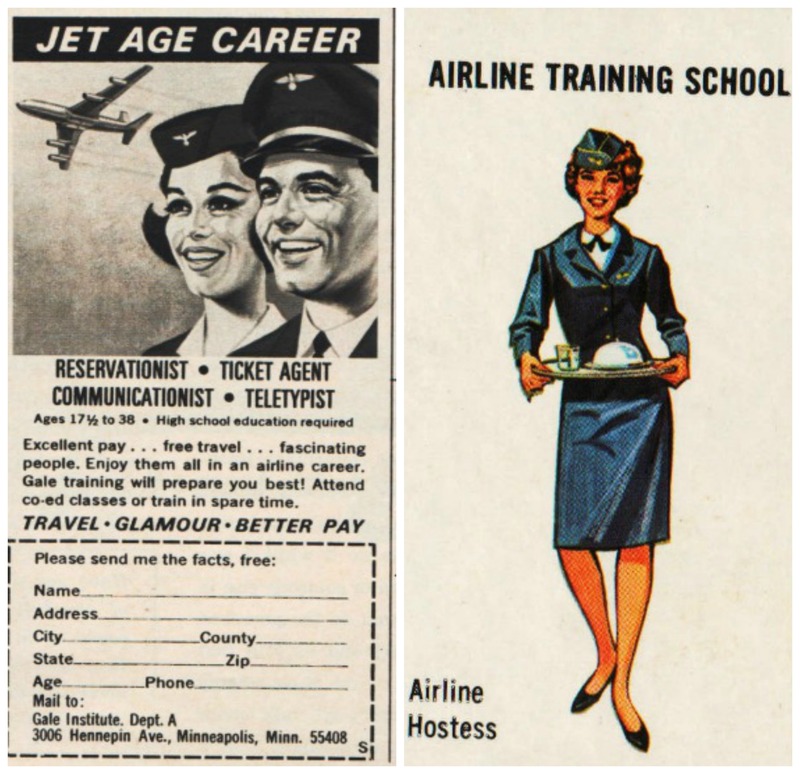 The 6 exciting career options offered in this game just for girls included nursing school to become a nurse, drama school to become an actress, college to become a teacher, ballet school to become a ballet dancer, airline training school to become an airline stewardess or everyone’s favorite, sashaying off to charm school to become a model. Charm school would clearly serve you well in securing a job in all the other fields which also seemed to require the oh-so important arts of visual poise, grace and charm, voice and diction, grooming essentials, figure control make up and hair styling and other social skills that would help you attain your goals more quickly and readily. 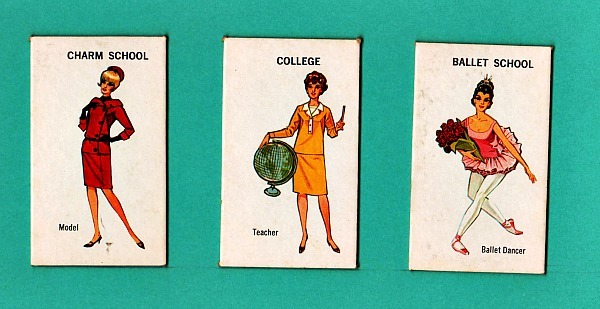 In the dog eat dog game world of high stake careers, girls competed by being the first to collect school, personality, and subject cards for specific careers. The game ended when one lucky player had collected 4 school cards of one profession and 2 subject cards and two personality cards that were good for that profession. After that, the sky’s the limit! There was a version of what Shall I be for boys the exciting career game for boys. Options for boys included going to law school to become a statesman, graduate school to become a scientist,medical school to become a doctor, college to become an athlete, technical school to become an engineer or flight school to become an astronaut. The board game merely reflected what we viewed in the media at large. 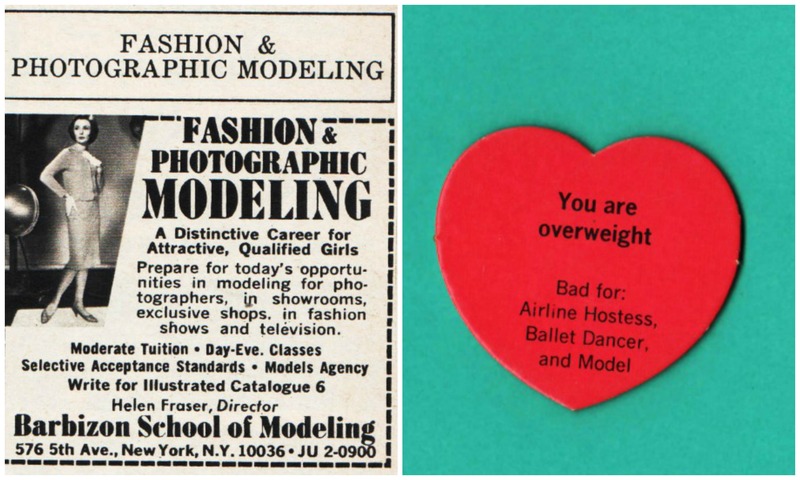 Flipping through Seventeen Magazine were the real life ads for exciting careers. In a few short years girls would rebel against the cards we were dealt. The woman’s movement would be the wild card in the future. 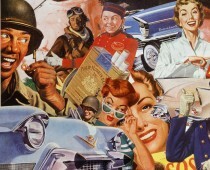 Which one of these exciting careers interests you the most? Charm school graduate, for sure. I love this post – fantastic! 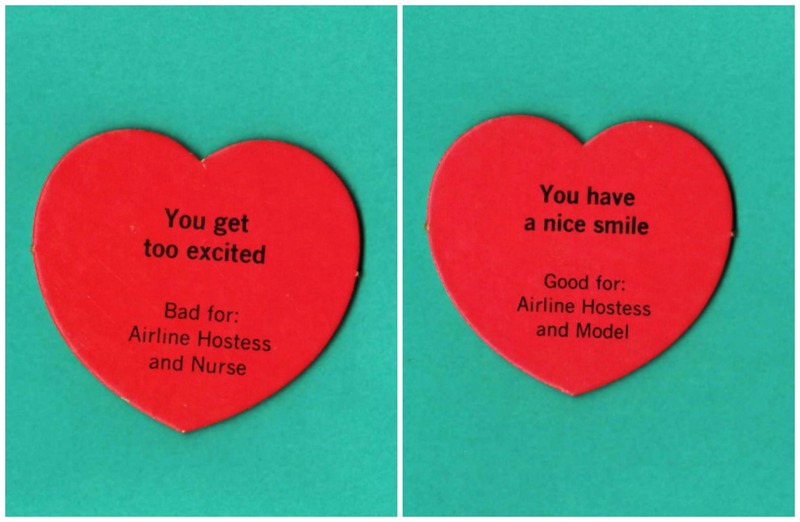 I wonder how many people took the advice of the board game and ended up in the career it chose for them? Glad you enjoyed the post. In answer to your question, I believe Meryl Streep was an avid player of this game always drawing the acting card, and well, you can see where that led her! If I had ever seen this game ~ and at my current age, there’s no way for me to know whether I had or not ~ I would have always been going for the Nurse cards, without fail. I had wanted to be a Nurse since the early 60’s, when I was probably 5 or 6. I came into the Baby Boom generation right in the exploding middle, in 1957, so all my friends and I were fed a consistent diet of “You can’t be that because you’re a girl” and “You have to be this because you’re a girl.” None of which ever made any sense to me, because I figured if I had the brains and physical endurance to be something, whatever difference would it possibly make if I were a girl, a boy or a kangaroo? 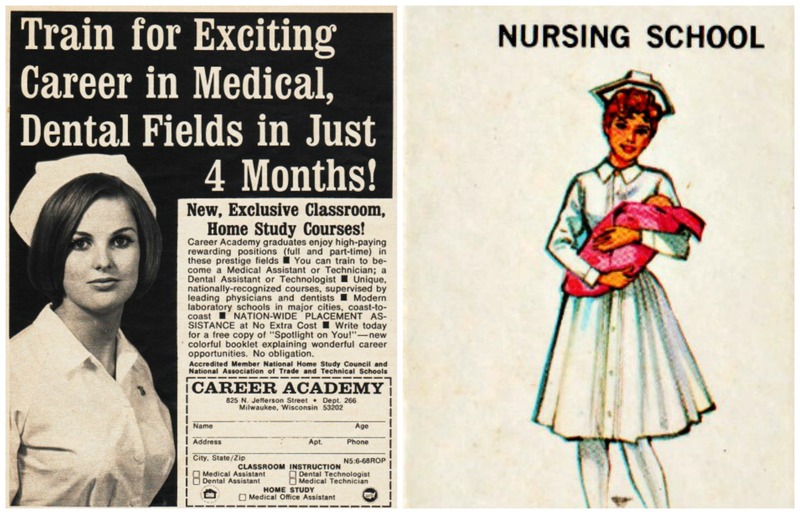 If boys could work their way into nursing school, or become teachers, or model clothes (and SOMEBODY was wearing all those boys and mens clothes in the catalogs and other print ads! ~ then it just made sense (to me) that I should be able to go do whatever I wanted, whether it was a nurse, a model or an astronaut or a pilot. And if not, there better be a much better reason why not other than “because you’re a girl!” And I wanted to be a nurse, not because I HAD to be one instead of being a doctor, but because I wanted to be one! I think I was actually attracted somewhat by those pretty nurse’s caps! And once I learned how to make some of them out of paper, no piece of white paper even remotely large enough was safe from my scissors and cellophane tape! I learned how accidentally, when we were making those stereotypical Pilgrims costume hats for girls in the 1st grade. I noticed the striking similarity immediately, and we were off! Because Life doesn’t always deal you the cards you need to win your chosen goal, like that board game, I didn’t get to become a nurse. But I was in LPN school long enough to get my covetted white cap, and even one blue corner stripe to indicate “Junior” status, but had to leave the program before getting the 2nd corner stripe for Senior status, or my diploma due to the impending arrival of our beautiful (surprise!) daughter! Later on, after having discovered a sort of similar profession I never knew about prior to entering LPN school, I graduated on the Dean’s List as a Surgical Technologist. I spent 15 very satisfying, productive years as a Certified Surgical Technologiist, before having to retire early due to a degenerative spinal condition, an electrically-based heart rhythm problem, and some other health issues.